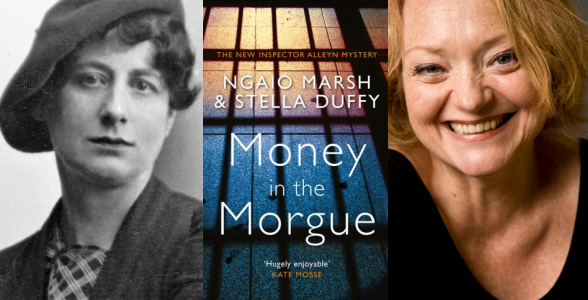 A New Zealand mystery that began more than seventy years ago has been longlisted for the prestigious CWA Dagger Awards, announced at Crimefest in Bristol last night. While the Second World War was raging, Ngaio Marsh brought her famed British detective Inspector Roderick Alleyn to her native New Zealand, exploring her own country and wartime issues. Along with being an ambulance driver during the global conflict, Marsh continued to write and published novels like COLOUR SCHEME and DIED IN THE WOOL. She also began writing another wartime mystery set in New Zealand, MONEY IN THE MORGUE, but it was never completed or published. Decades later, its opening, a few chapters, and some notes scrawled on the back of a Shakespeare script were discovered at a research library in New Zealand. From those seeds, New Zealand-raised novelist and theatremaker Stella Duffy resurrected the mystery and wrote the first Inspector Alleyn novel to be published in more than 30 years. Last night in Bristol, Marsh and Duffy's 'collaboration' was named on this year's longlist for the CWA Historical Dagger, which honours great crime novels set in a time period of at least 50 years ago. The Marsh/Duffy book was just one of many interesting talking points among this year's Dagger longlists. Philip Kerr, who recently passed away, was also named on the Historical Dagger longlist for PRUSSIAN BLUE. Several books were longlisted for multiple Daggers, including debuts THE SEVEN DEATHS OF EVELYN HARDCASTLE by Stuart Turton (Gold Dagger and John Creasey (New Blood) Dagger), and RESURRECTION BAY by Australian author Emma Viskic (Gold and Creasey), along with A NECESSARY EVIL by Abir Mukherjee (Gold and Historical Daggers) and LONDON RULES by Mick Herron (Gold and Ian Fleming Steel Daggers). Rotorua Noir Guest of Honour and Icelandic crime writer Lilja Sigurdardottir was among the translated authors named on the CWA International Dagger longlist, for SNARE, translated by Quentin Bates. Here is the full list of Dagger categories and longlisted tales. Shortlists in all of these categories are anticipated by July, with winners to be declared during a Dagger Awards dinner in London on Thursday, October 25.